V&A Jewellery - Mughal-inspired reversible red and green pendant: This range was inspired by a reversible necklace made by Robert Phillips for the Paris Exhibition of 1867. He himself was inspired in this instance by a Mughal thumb ring. 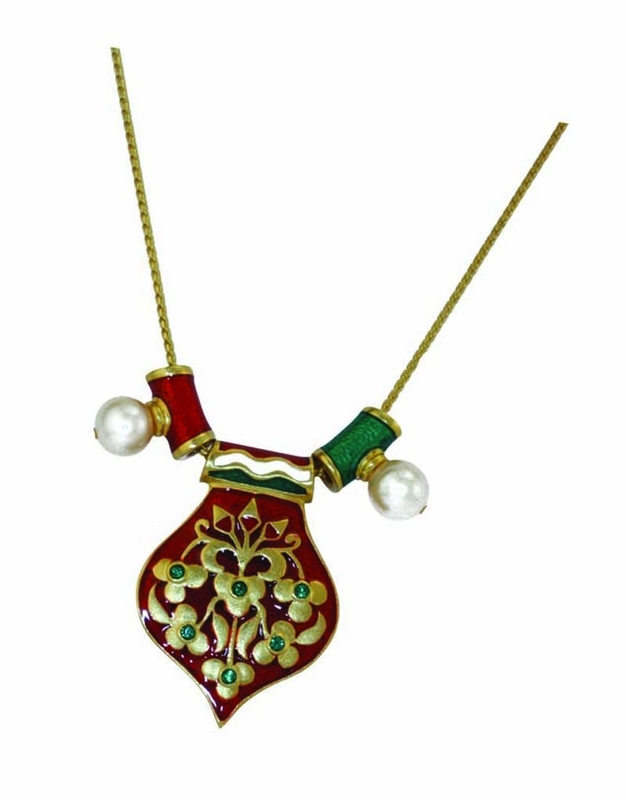 This necklace is reversible red and green and is 24ct gold-plated with SWAROVSKI ELEMENTS and fresh water pearls. This piece is inspired from an object in The Victoria and Albert Museum, London. V&A Jewellery - Serpents - a serpent-shaped ring suggested by a bracelet in the form of a snake dating from the 1st - 3rd centuries. V&A Jewellery - This bracelet is inspired by a number of bracelets suggested by the Cheapside Hoard, circa 1600 (though to be a goldsmith's stock, the Hoard was discovered buried under floorboards in 1912).